Welcome to Replay Rewind, a look back at some notable video reviews in baseball. In this inaugural edition, Arizona loses a home run due to a base-running blunder and Cincinnati earns a two-base bunt. Marrero briefly runs past the entirety of Avila. 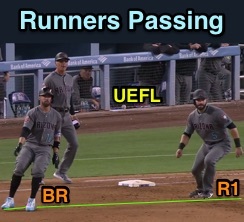 R-111 (Passing Runners; Overturned): Saturday night at Dodger Stadium, Diamondbacks batter Deven Marrero blasted Dodgers starter Rich Hill's 75th pitch of the ballgame over the left-center field wall for a three-run home run, scoring runners from first and second base. With baserunner R1 Alex Avila retreating toward first base for a potential tag-up play with one out as batter-runner Marrero rounded the bag, Dodgers Manager Dave Roberts elected to challenge the umpires' ruling that Marrero did not pass Avila. Replay HQ cited the accompanying image, captured from the center field camera, as its Definitive Angle in opting to overturn the umpires' ruling that the BR Marrero did not pass R1 Avila. Thus, Marrero was declared out and his run nullified, for a two-RBI single. No matter, Arizona still won the game in blowout fashion. Gibson sees the ball, but not the baserunners. What's odd about this play is Arizona broadcaster Steve Berthiume's observation that 2B Umpire Brian Gorman (and not the first base umpire) signaled the BR/R1 interaction as legal, that 1B Umpire Tripp Gibson appeared to be the only umpire to significantly move during this play (3B Umpire Dan Iassogna appeared to have never left the infield dirt), and that no umpire saw the interaction around first base (replays indicate Gibson, for instance, was looking in the opposite direction as Marrero rounded first base). In the end, R-111 reads "Passing, 73 Gibson, R-QOCN." See the following Case Play for more about the rule regarding a trailing runner passing a predecessor. Related Post: Case Play 2016-11 - Time to Pass a Runner [Solved] (9/16/16). A poor throw leads to a boundary replay. 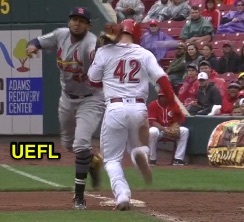 R-127 (In Play/Out of Play; Overturned): Sunday in Cincinnati, Reds batter Tucker Barnhart bunted to Cardinals third baseman Greg Garcia, who threw to first baseman Jose Martinez as Barnhart arrived at first base. Garcia's throw was into the batter-runner, bounced off Barnhart, and caromed toward the end of the first-base dugout. Replays indicate BR Barnhart prematurely exited the 45-foot runner's lane, and was on the grass when he was struck by the throw, appearing to block first baseman Martinez from his attempted catch; however, HP Umpire Alan Porter declined to rule interference because Garcia's throw was of poor quality. As the Wendelstedt manual would put it, Garcia's throw could not reasonably retire Barnhart, and for that reason, runner's lane interference was not called. With RLI out of the picture, offensive manager Bryan Price challenged HP Umpire Porter's ruling that the ball was in play. This is a difficult get for the plate umpire if for no other reason than Porter was on the foul line ruling on Barnart's legality at the time of the potential stadium boundary issue. The Replay Official thus overturned Porter based on the finding that the ball hit an object inside the camera well before bounding back onto the playing field; RLI, obviously, is not reviewable. Mike Scioscia tried protesting a game based on an RLI no-call in 2016; naturally, MLB denied it. Related Post: Angels Protest Cuzzi RLI No-Call in Kansas City [Denied] (7/27/16). See the following analyses regarding batter-runner positioning and potential RLI interference. Related Post: Running Lane Interference and Advancing to 1st Base (9/6/15). Related Post: Runner's Lane Interference Plagues Chicago's Heyward (5/24/17).